Flowers that are visited and/or pollinated by hummingbirds typically fit the following description: petals are brightly colored, often red; petals are fused to form a long, narrow tube; a “landing pad” is absent; abundant nectar is produced deep within the flower; and fragrance is weak or nonexistent. Scarlet gilia (Ipomopsis aggregata) is a typical example of such a flower, and hummingbirds are indeed among its most common visitors. But there is so much more to the story. Scarlet gilia (also commonly known as skyrocket) is a wildflower in the phlox family (Polemoniaceae) that occurs in many parts of western North America. It is considered a biennial or short-lived perennial. It spends the first year or so of its life as a compact rosette of fern-like leaves. Later it sends up a branched, flowering stem that can reach 5 feet tall or more. The flowers are slender, trumpet-shaped, and composed of five fused petals that flare outward creating five prominent, pointed lobes. They are self-incompatible and require a pollinator in order to set seed. The stamens of an individual flower produce mature pollen before the stigma of that flower is ready to receive it – this is called protandry and is one mechanism of self-incompatibility. The flowering period of scarlet gilia can last several months. Depending on the location, it can begin in mid-summer and continue through the fall. During this period, it produces dozens of flowers. It is also at this time that it runs the risk of being browsed by elk, mule deer, and other animals. This doesn’t necessarily set it back though, as it has the potential to respond by producing additional flowering stalks and more flowers. Its flowers are visited by a variety of pollinators including bumblebees, hawkmoths, butterflies, syrphid flies, solitary bees, and of course, hummingbirds. But hummingbirds, in many parts of scarlet gilia’s range are migratory, and that’s where things get interesting. Early flowers of scarlet gilia are usually red. As the season progresses, flowers slowly shift from red to pink. In some cases, they lose all pigmentation and become white. In the early 1980’s, pollination biologists Ken Paige and Thomas Whitman set out to determine the reason for this shift in flower color. They spent three years observing a population of scarlet gilia on Fern Mountain near Flagstaff, Arizona. They noted that the change in flower color corresponded with the migration of hummingbirds and that the now lighter colored flowers continued to be pollinated by hawkmoths until the end of the flowering season. A series of experiments and observations led them to conclude that hummingbirds prefer darker colored flowers and hawkmoths prefer lighter colored flowers. By shifting to a lighter flower color, scarlet gilia appeared to be taking advantage of remaining pollinators after hummingbirds had migrated. They also concluded that the color change was not the cause of hummingbird migration since other flowers with nectar-rich, red, tubular flowers (specifically Penstemon barbatus) remained available in the area throughout their migration. It was also noted that the flowers of scarlet gilia shifted the timing of nectar production, presumably to better match the behavior of hawkmoths which are more active in the evenings. No plants were observed shifting from light colored flowers to dark colored flowers, which further supported their conclusion. They also compared the population they studied to populations that do not lose their hummingbird pollinator and noted that when hummingbirds remain, the flowers of scarlet gilia don’t change color. But just how effective are hummingbirds as pollinators of scarlet gilia? A seperate study carried out by a different group of researchers determined that, while hummingbirds were “the most common floral visitor,” long-tongued bumblebees were the more effective pollinator when it came to pollen deposition and seed set. 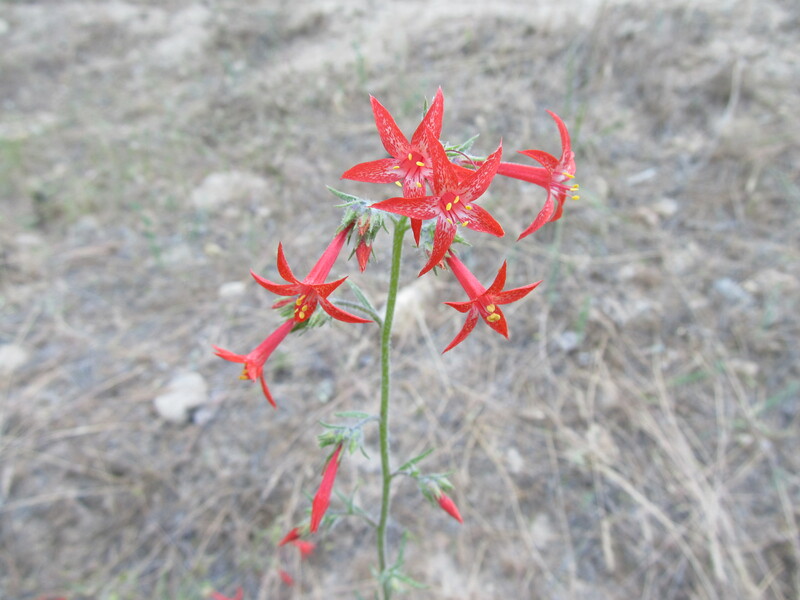 The study involved observations of a scarlet gilia population in Colorado over a 5 year period. Considering how well the floral traits of scarlet gilia match up with the hummingbird pollination syndrome, it is surprising to learn that long-tongued bumblebees are comparatively more effective at pollinating them. The second explanation proposed by the authors is that “selection favors some degree of floral generalization, but that flowers can retain features that adapt them to a particular type of pollinator in spite of generalization.” In the case of scarlet gilia, specialization could be detrimental because after they send up their flower stalks, they are doomed to die. This gives them only one season to set seed, and if hummingbirds are either not available that year or only available in limited numbers, a scarlet gilia population can lose the opportunity to reproduce. As the authors put it, “the fact that individual plants enjoy only a single season of reproduction, suggests the value of ‘backup’ pollinators.” This may also explain why flower color shifts in order to take full advantage of hawkmoth pollination after hummingbirds are gone. On January 31, 1971, Apollo 14 left Earth and headed for the Moon. It was the eighth manned Apollo mission and the third to land on the Moon. On board were three astronauts – Alan Shepard, Edgar Mitchell, and Stuart Roosa. Joining the astronauts were about 500 tree seeds that were given to Roosa by Ed Cliff, the Chief of the Forest Service at the time. While Shepard and Mitchell explored the surface of the Moon, Roosa and the seeds hovered above it in the spacecraft. After Shepard had hit a couple of golf balls and Roosa had circled the Moon 34 times, the crew rejoined and headed back to Earth. Roosa’s collection of tree seeds consisted of 5 species – Douglas fir, redwood, loblolly pine, sycamore, and sweetgum. Upon returning to Earth, Roosa handed the seeds back over to the Forest Service. They were then planted at Forest Service stations in Mississippi and California. Some of the seedlings were planted adjacent to trees grown from seeds that had remained on Earth in order to conduct a comparison study. The other seedlings were available for dissemination. Around this time (1976-77), America was celebrating its bicentennial, so many of the trees were planted in commemoration of this event. A loblolly pine was planted at the White House. A sycamore was planted in Washington Square in Philadelphia. Valley Forge got a Moon Tree, and so did Brazil, Japan, and Switzerland. Moon Trees were planted at various parks and institutions in many states throughout the country. In fact, there were so many requests for Moon Trees that several rooted cuttings of the original seedlings had to be produced. Unfortunately, in the frenzy of shipping out Moon Trees, a complete record of where and when the trees were planted was not maintained, and so it remains unclear where all the trees are today and how many of them are surviving. 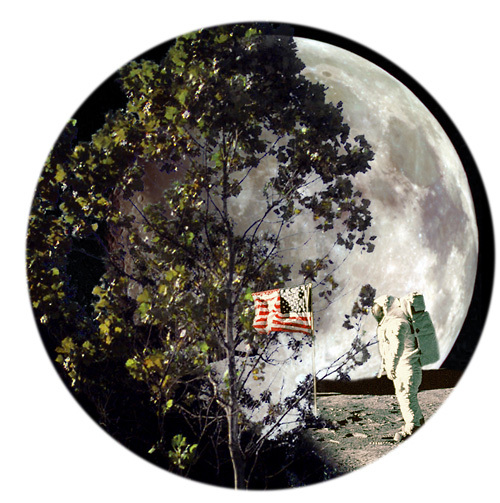 When NASA employee, Dave Williams, became aware of Moon Trees, he embarked on a quest to compile a list of them. His webpage contains the short list of trees he has been able to confirm and document so far. According to Williams’ list, Idaho received two Moon Trees. A sycamore was planted at University of Idaho in Moscow, and a loblolly pine was planted at Lowell Elementary in Boise. The sycamore perished sometime within the last decade. The loblolly pine remains…but perhaps not for long. 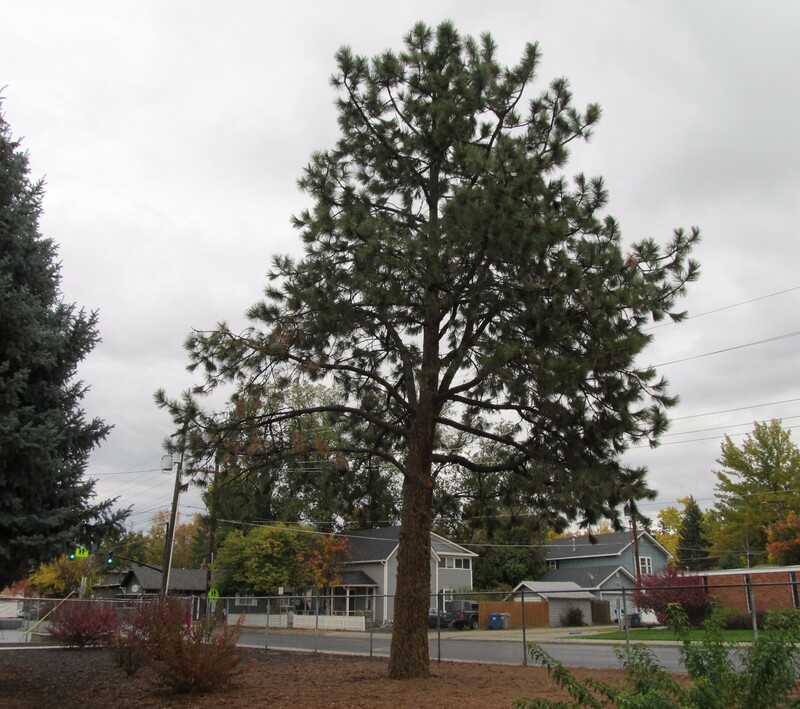 Loblolly pine (Pinus taeda) at Lowell Elementary in Boise, Idaho – one of many Moon Trees planted in the 1970’s. And this is how I came to learn about Moon Trees. This fall, local news reported on efforts being made to save Boise’s Moon Tree. The soil around it is compacted, it’s not getting enough water, and it has become infested with a pest insect. When community members learned of its potential demise, they resolved to save it. Money was raised to pay for the water it requires, and a local tree company volunteered to assist with necessary treatments. Its future remains uncertain; however, this renewed awareness and attention may be just what it needs to survive. Upon learning about Boise’s Moon Tree, I decided to pay it a visit. After all, not only is it in my hometown, but it is also in my neighborhood, just a short walk from my house. It was pretty obvious right away which tree was the Moon Tree as its trunk is completely covered in oozing sap – a sure sign of infection. It is also located in a spot that doesn’t appear to be receiving any supplemental irrigation. The stresses caused by compacted soil and dehydration left it vulnerable to attack. But maybe it wasn’t the best tree for the site to begin with. Loblolly pine (Pinus taeda) is native to the southeastern United States where it is commonly found growing in acidic, wet soils – a stark contrast to the dry, alkaline soils of the Treasure Valley. Still, it is Idaho’s only known remaining Moon Tree – a tree whose seed went to space, circled the moon, and was brought back to Earth where it was planted in celebration of the 200th anniversary of this nation. It is worth saving, with the hope being that it will inspire not only a connection to the natural world but also to the broader universe which all living beings call home. Gardener seeking shrub. Must be drought tolerant. Must have year-round interest. Must be easy to grow and maintain. Preferably flowers in late summer or early fall. Must be attractive – not just to humans, but to wildlife as well. Serious inquiries only. My answer to a solicitation such as this would be rabbitbrush. While there may be other perfectly acceptable plants that fit this description, I think rabbitbrush deserves major consideration. It’s easy to grow and can be kept looking attractive throughout the year. When it is flush with vibrant, golden-yellow flowers at the close of summer, it not only becomes the star of the garden visually, but also a savior to pollinators readying themselves for winter. Plus, it requires little to no supplemental water, making it a true dry garden plant. There are many species that go by the common name rabbitbrush. The two that I am most familiar with are Ericameria nauseosa (rubber or gray rabbitbrush) and Chrysothamnus viscidiflorus (green or yellow rabbitbrush). Both of these species are native to western North America, and both have a number of naturally occurring varieties and subspecies. 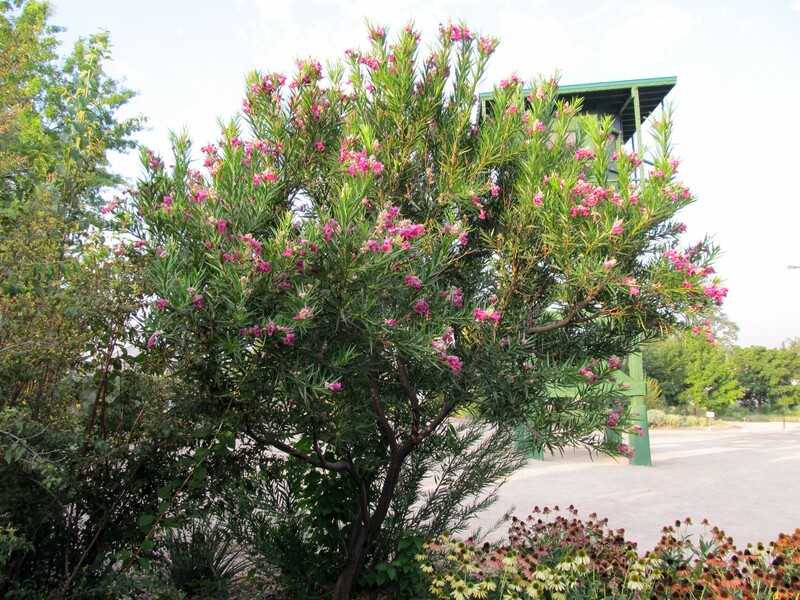 Rubber rabbitbrush is a densely branched shrub that reaches an average height of 3 feet. 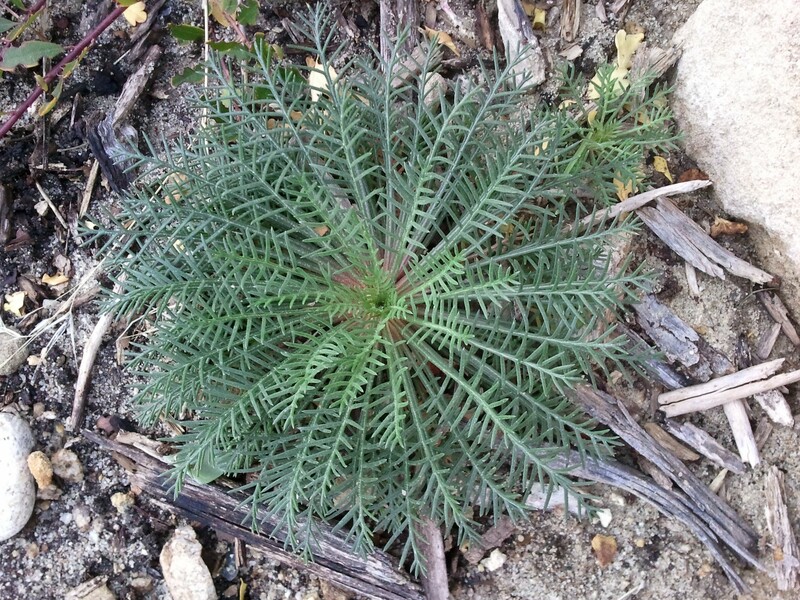 Its leaves are slender and numerous, and its stems and leaves are covered in short, white, felt-like hairs giving the plant a light gray appearance. 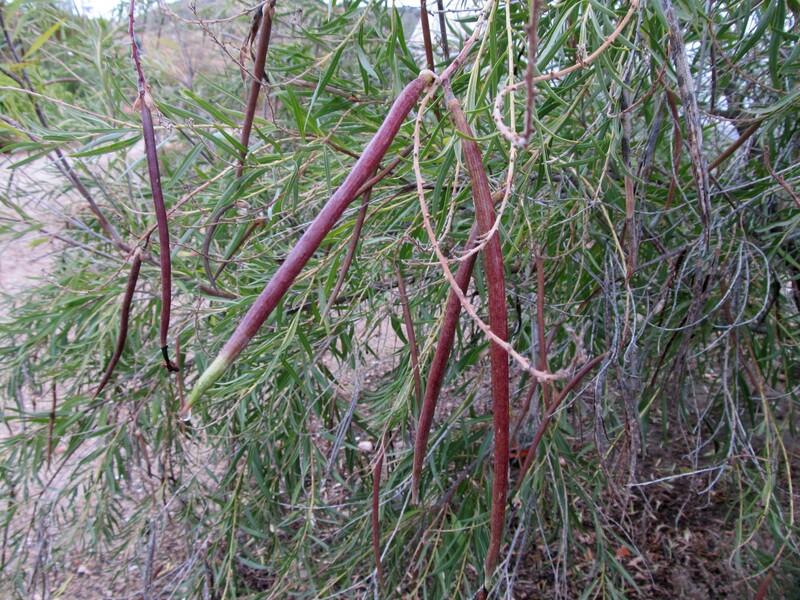 Native Americans used the flexible branches of this plant to weave baskets. They also made a tea from the stems to treat coughs, colds, chest pains, and toothaches. Bundles of branches were burned to smoke animal hides. The stems and roots contain a latex sap, and certain Native American tribes are said to have used this sap as chewing gum, possibly to relieve hunger or thirst. A rubber shortage during World War II led to investigations into extracting the latex from rabbitbrush. This idea was soon abandoned once it was determined that even if every rabbitbrush in the West were to be harvested, the resulting increase in rubber would be modest compared to other sources. Green rabbitbrush is typically smaller than rubber rabbitbrush, reaching a maximum height of about 3 feet. Its stems and leaves appear similar to rubber rabbitbrush except they lack the dense, white hairs and are brown and green respectively. Also, the stems and leaves of green rabbitbrush have a stickiness to them, and the leaves are often twisted or curled. Rabbitbrush is a member of the sunflower family (Asteraceae). Plants in this family generally have inflorescences that are a combination of ray and disk flowers (or florets) clustered tightly together and arranged in such a way that the inflorescence appears as a single flower. Consider sunflowers, for example. What appear to be petals around the outside of a large flower are actually a series of individual ray flowers, and in the center are dozens of disk flowers. Both rubber and green rabbitbrush lack ray flowers, and instead their inflorescences are clusters of 5 or so disk flowers that are borne at the tips of each branch creating a sheet of yellow-gold flowers that covers the shrub. Native Americans used these flowers to make dyes. 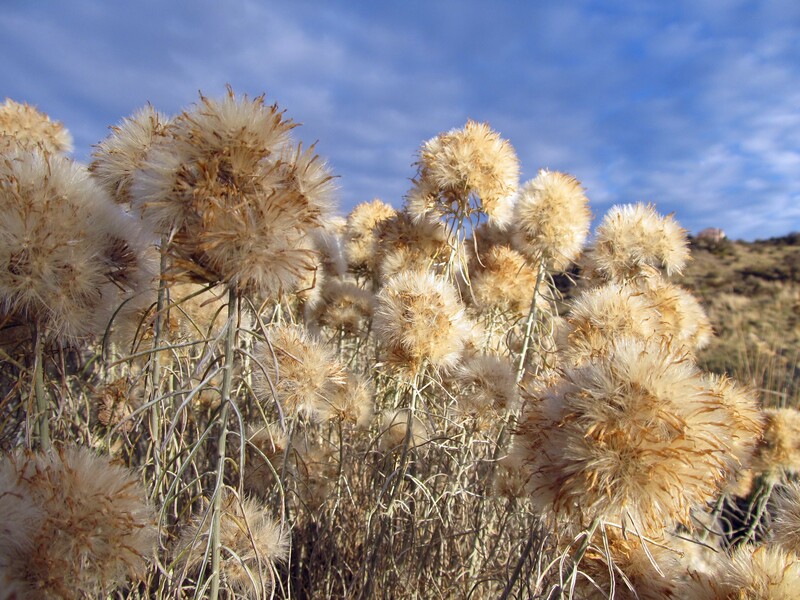 The fruits of rabbitbrush are achenes with small tufts of hairs attached. Each achene contains one seed. The tuft of hair (or pappus) helps disseminate the seed by way of the wind. Many of the fruits remain attached to the plant throughout the winter, providing winter interest and food for birds. 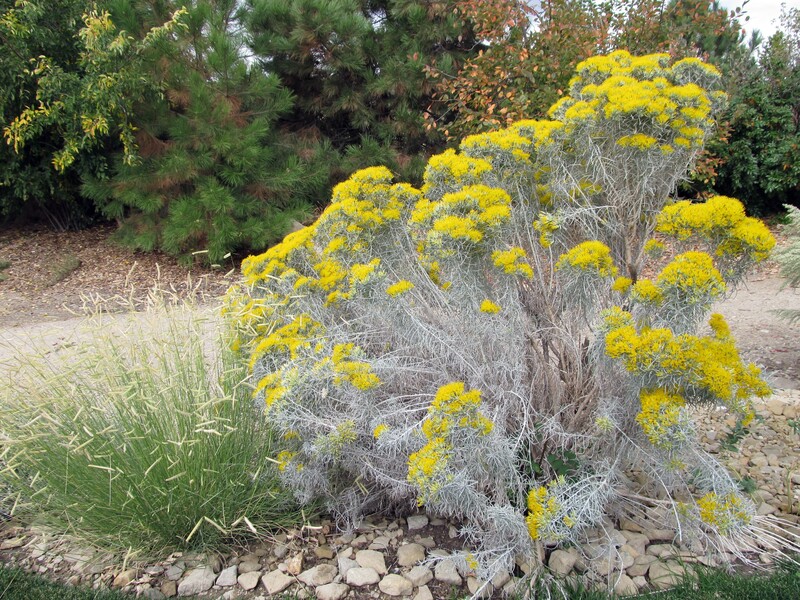 As rabbitbrush ages it can become gangly, floppy, or simply too large for the site. This can be avoided easily by cutting the plant back by a third or more each fall or spring, which will result in a more manageable form. It can also be cut back nearly to the ground if it is getting too big. The leaves, flowers, stems, and seeds provide food for a variety of animals including birds, deer, and small mammals. The plant itself can also provide cover for small mammals and birds. Oh, and did I mention that it’s a pollinator magnet. It has wildlife value, it’s drought tolerant, it’s easy to maintain, and overall, it’s a beautiful plant. What more could you ask for in a shrub? The photos in this post were taken at Idaho Botanical Garden in Boise, Idaho. Hailing from dry washes and riverbanks of the desert southwestern United States and northern Mexico, desert willow is a tough tree or large shrub with delicate, showy flowers and wispy foliage. Its beauty and its ruggedness has made it a popular plant for dry gardens. It requires little attention maintenance-wise, yet attracts all kinds of attention otherwise. 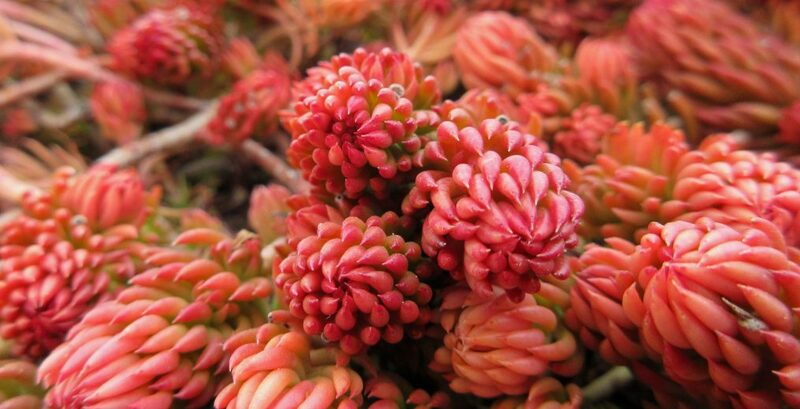 If you live in a desert climate that generally stays above 0 degrees Fahrenheit during the winter, this plant belongs in your garden. A member of the family Bignoniaceae – a family that consists of at least 8o genera including catalpa (Catalpa spp.) and trumpet vine (Campsis spp.) – Chilopsis linearis is the sole member of its genus. The common name, desert willow, refers to its habitat and its long, slender, oppositely and alternately arranged leaves that resemble those of many willows (Salix spp.). Other common names include flowering willow, willowleaf catalpa, desert catalpa, and false-willow. There are two recognized subspecies – linearis and arcuata. Desert willow is found most commonly in areas where seasonal flooding occurs. Known as desert dry washes – or simply dry washes or desert washes – these are areas in the desert where runoff from heavy rains accumulates resulting in saturated soils followed by a prolonged dry period. Groundwater often remains accessible year-round to the deep roots of plants in this type of habitat. Desert willow shares this habitat with several other large shrubs and small trees including mesquite (Prosopis spp. ), palo verde (Parkinsoinia spp. ), and smoketree (Psorothamnus spinosus). Desert willow occurs along stream banks and river banks as well, where seasonal flooding also occurs. Desert willow generally reaches a width of 10 to 15 feet and a height of at least 15 feet, although it has the potential to grow taller than 30 feet. It often has an open and sprawling or leaning habit, but it can be pruned to look more tree-like. Pruning can also result in more flowering, since flowers appear on new growth and pruning encourages growth. Watering this plant during the dry season can also lead to a flush of growth and more flowering. This is something to keep in mind, as it is the flowers that are the star of the show. Persisting from late spring through midsummer (and sometimes longer), the 1 to 2 inch, trumpet-shaped, pink to rose to purple blossoms are hard to miss. They occur singularly or in clusters at the tips of branches. The ruffled-edges of the petals and the prominent streaks of color within the corolla tube add to the attraction. Hummingbirds, butterflies, and bumblebees are common visitors to these fragrant flowers. Summer rains or occasional watering can encourage flowering throughout the summer. Overwatering, on the other hand, can be detrimental. The flowers eventually form long slender seed pods called capsules that reach up to 10 inches long. Inside the capsules are a series of hairy seeds. 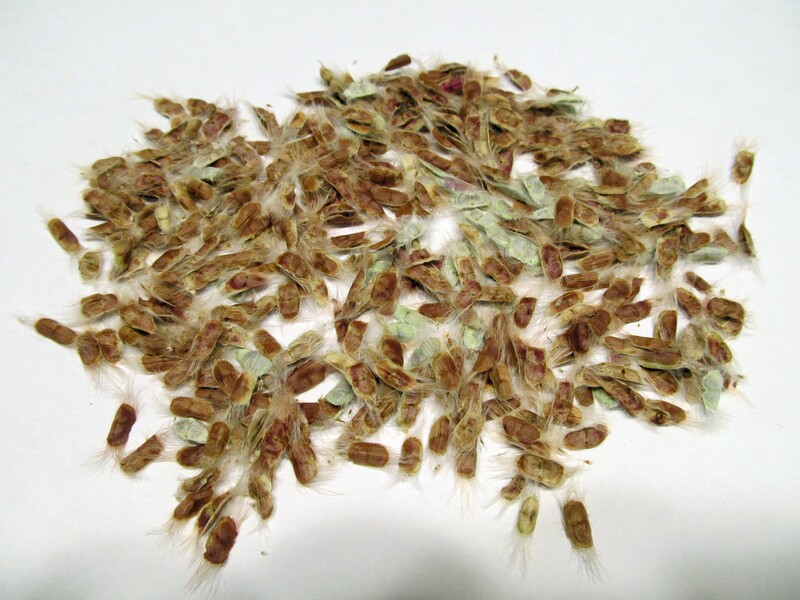 The hairs form small wings on the sides of the seeds. The seeds are eaten by a variety of bird species. Various species of birds can also be seen nesting in desert willow, and a variety of other animals use desert willow for browsing and/or for cover. Desert willow prefers sunny, southwest facing sites and tolerates most soil types. It performs best in soils that are well drained, low in organic content, and have a pH that is neutral to alkaline. The soil can be saturated at times, but should be given a chance to dry out – just like in its natural habitat. Avoid the impulse to add fertilizer. Desert willow is said to be easy to propagate from cuttings or from seeds. It is commercially available, and several cultivars have been developed offering diverse flower colors and other special traits. 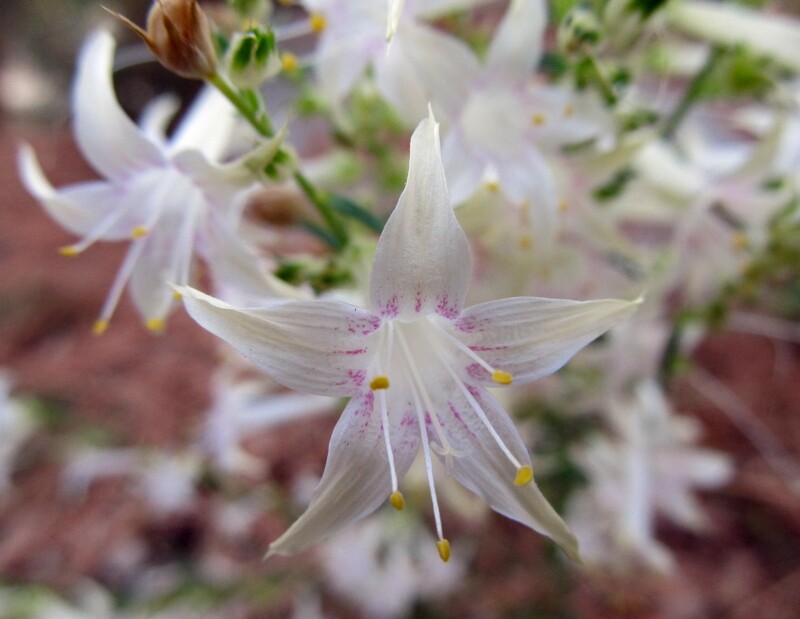 It’s easy to grow, requires little attention, and provides an eye-catching floral show – all excellent reason to add this plant to your water-efficient landscape. One tip from my experience seeing it survive the winters of southwestern Idaho: the deciduous leaves of Chilopsis linearis don’t reappear until very late in the spring – so late, in fact, that one might start to worry that the plant has perished. Don’t fret though; some winter kill is possible if sub-zero temperatures were experienced, but most likely it is still alive.